If your site has a static home page and a different page to display blog posts, and if you find that when you publish a new post, it doesn't show up on the site right away, there are two likely solutions. This way, WP Rocket will detect which page’s cache it needs to clear when you publish a new post. 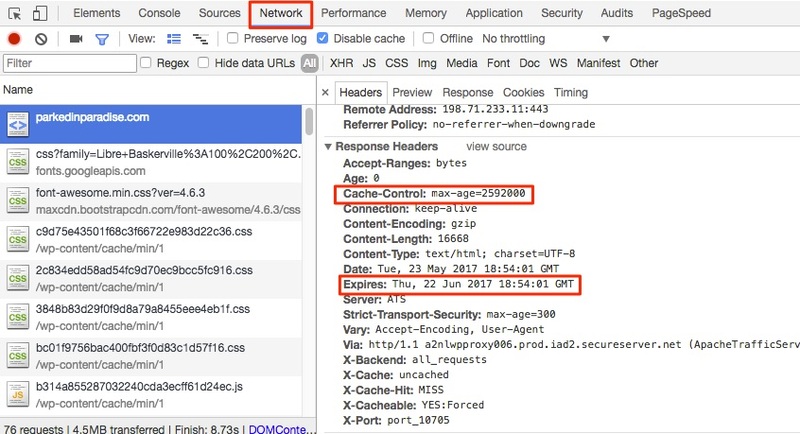 If you find that refreshing your browser cache solves the problem, it means something is setting a long browser caching rule on the HTML for your page. WP Rocket doesn’t do this by default (to avoid this precise issue), but some server-side rules, or conflicting .htaccess rules could cause this problem. In this case you can see that the max-age (defined in seconds) is set to 1 month, and the Expires inherits that value (screenshot taken on May 22nd 2017). This will prevent new content showing up right away. If you see this issue, check your .htaccess rules, or ask your web host if it’s in the server configuration. If you use Varnish, Cloudflare, CloudProxy (from Sucuri), Incapsula, or any other form of caching, you may need to clear that cache manually to see your content.